Chromium has a labs feature through which you can enable 'Tabbed Options' in Ubuntu. 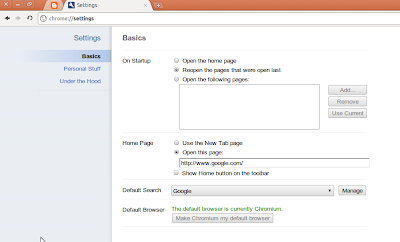 Its very easy to do but will require Chromium daily build version. After getting the daily build version type "about:labs" in address bar and hit enter. You will be brought to Chromium labs page. Just enable tabbed options and restart Chromium. Now next time when you go to preferences it will open in a tab rather than a pop-up window.